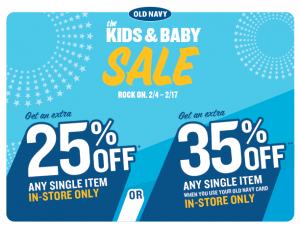 If you are headed to Old Navy this weekend, be sure to print THIS COUPON good for 25% off (or 35% off with your Old Navy Card) one item, even clearance! 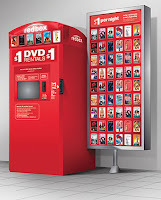 Rent a FREE movie at Redbox! Use the code QM4KTX6 at any Redbox location to get a FREE night's rental! The code has been confirmed to work but expiration is unknown, so let me know if it doesn't work for you! Simply wear red to Macy's until 2/6 for an additional 20% off!! The discount applies to sale, clearance & select regular-priced purchases . Receive an EXTRA 10% OFF select departments, exclusions apply. Use WEARRED if shopping online. Remember the Edy's ice cream deal? These are NOT advertised as part of the deal, so maybe have them priced checked to make sure they are actually $2.99. It is only the STRAWBERRY that is included. Bank of America is hosting a Free Museums On Us day February 5th & 6th. If you are a Bank of America cardholder you can take advantage of this awesome deal! There are over 100 locations across the US. Just go HERE and see participating Museums, Zoos, Science Centers, Botanical Gardens & more in your area. Then just present any Bank Of America Card! Swagbucks is offering five new bills. 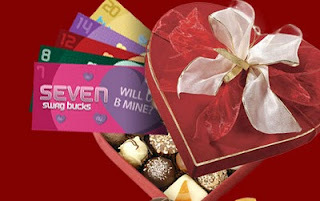 Each bill has a candy heart with a different message on it - there's a 7, an 8, a 12, a 14 and a 20 - snag 'em all before Valentine's Day ends and you'll earn a 50 Swag Buck bonus, which they'll award on the 16th. You can only win these bills through search. 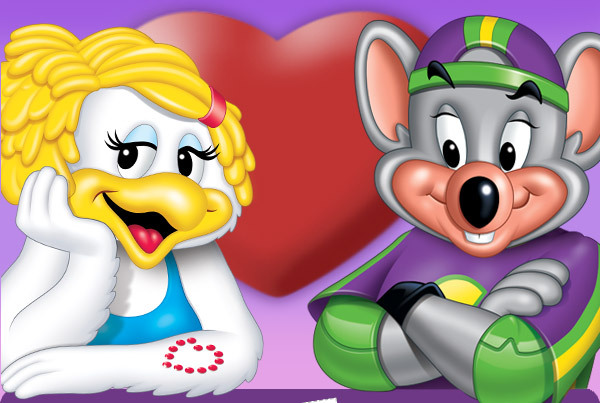 Chuck E. Cheese is offering FREE printable Valentine's cards. Each card contains a coupon good for 5 FREE tokens at Chuck E. Cheese. Download the template and print as many as you need. Cards expire March 2. Today's "Pocono resort getaway" through Eversave is soooo tempting!! More Information on this deal from Eversave can be found HERE! 30 bags of chips and 10 icecreams free for our household. Call me crazy! So, I had some .75/2 coupons for chex from awhile back and ended up with like 30 bags of chex mix (I plan to share,share, share!) and also 10 boxes of Edy's icecream. With the Edy's you get $2 UPS register rewards with each box you buy at $2.99. But when you buy $15 dollars of certain snacks you get $5 registar rewards, plus I have others saved up, so the ice cream was free also. My pantry and freezer are FULL! There are two new Chex Mix Coupons today – making for cheap or free Chex Mix at Rite Aid. If your store was out, make sure you check with the manager. My store is getting in ice cream in today to meet the demand. I have been loving Groupons! Limit 6 per person. Limit 1 per visit. Must use in 1 visit. Not valid with other offers. Tax included. This is on NOMORERACK today! At $9, with $2 shipping, you could get 2 (or something else) for $22 minus $10 credit SO 2 for $12 shipped!!!! Don't forget to use your $10 off $20 credit....or get it if you didn't already! Find the info HERE! BIG NEWS! You said it, we read it - Because so many of you were unable to participate in last week’s giveaway, we’ve decided to give another 10,000 FREE coupons for NEW Nice ‘n Easy Color Blend Foam on Wednesday, February 2nd! We’ve been reading all the comments and want to give everyone another shot at a free box, so Wednesday’s giveaway will be at 9PM EST. Who’s excited to Foam it up?! Promotion runs from February 1 through February 14. In order to receive your free promo code, you must provide a valid email address at checkout. Promo codes will be emailed within 72 hours and expire one week after you receive them. There is no limit on the number of promo codes you can earn. 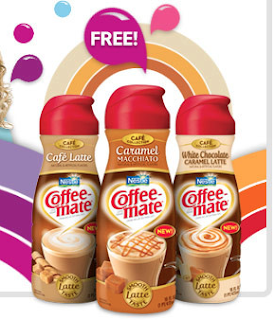 Coffee-mate has proclaimed this Friday, February 4th as FREE flavor Friday! They'll be giving away 100,000 bottles of FREE Coffee-mate creamer. Make sure to visit the Coffee-mate Facebook page on Friday, February 4th at 12 pm EST to snag your coupon. These will go fast! Great way to buy used kids' clothes! DealPulp.com is offering a hot deal today. 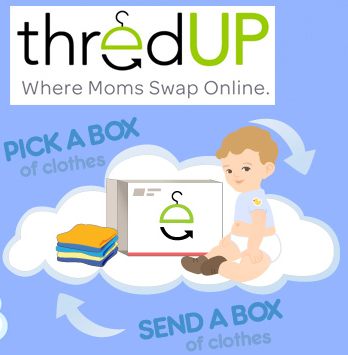 For just $6, you can get a voucher for a box of gently-used children’s clothing from ThredUp. If you’ve not ordered from DealPulp before and you sign up through this link, you should get a $5 credit added to your account, making the box of children’s clothing only $1 shipped to your door! Note: If you signed up and didn’t get a $5 credit, you can contact DealPulp and they’ll add the credit to your account manually. •Pick a box of pre-loved kids clothes in the size and gender you need for only $6, and have it delivered to your door for free . •The average box on thredUP contains 15 clothing items and includes top brands like: GAP, Carter's. Children's Place, Osh Kosh and Gymboree. Newegg has this 100 Pack of Imation CD-R for $9.99 with free shipping, the best price we could find by $10. With 100 CDs you'll have a lot of backup storage and room for a lifetime's worth of road trip mixes. Each CD can hold up to 700MB of data. Sales tax is only charged in CA, NJ, and TN.